While the opposition alleged BJP of “horse-trading”, the party clarified that they have not approached anyone and that the support from various leaders was being offered as they expressed faith in the leadership of Prime Minister Narendra Modi and the CM. As the polling on ten seats in the 245-member Rajya Sabha began in Uttar Pradesh, talks of cross-voting appeared to play spoilsport for the opposition, especially for BSP’s ninth candidate, Bhim Rao Ambedkar. 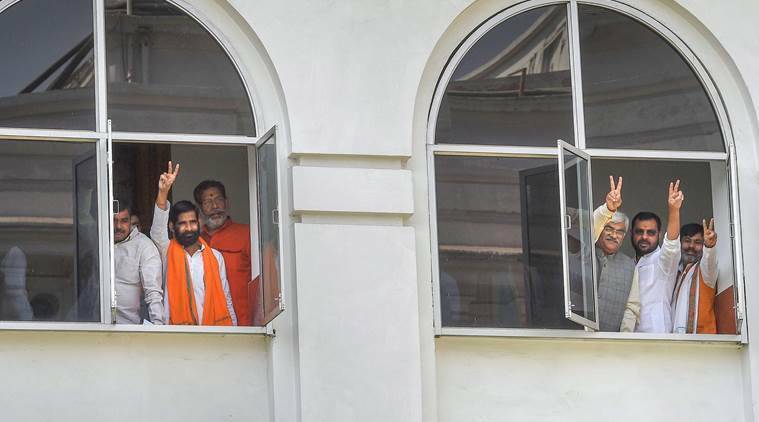 While each political party claimed that their votes were intact, some MLAs shifted their loyalties claiming that they voted in favour of “Maharaj ji”, UP Chief Minister Yogi Adityanath. A neck to neck fight continued between BJP’s ninth candidate, who appeared short of atleast five votes and BSP candidate who was short of three votes, at the time of filing this story. Challenges for BSP’s Ambedkar increased after party MLA Mukhtar Ansari and SP MLA Hariom Yadav was not allowed to vote by the court. As the voting began at 9 am, SP MLA and former Minister Shivpal Yadav was among some of the early voters in the assembly. Amid talks of cross-voting, Shivpal hinting at Jaya Bachchan assured that “both the candidates would win”. Earlier in the day, CM Adityanath, also visited BJP Legislative Party office to meet the MLAs. However, as the day progressed, NISHAD party lone MLA Vijay Mishra made it clear that he had voted in favour of BJP to keep the unity of the country alive. “Desh ki akhandata, bharstachara mukti…desh ke gareeboon ko dhyan me rakhte hue vote diya, (Voted for unity, corruption-free country, keeping in mind the poor people of India),” said Mishra. The shift in allegiance comes on the heels of Gorakhpur bypolls where the party had supported the SP-BSP combine. Soon, BSP MLA Anil Singh also claimed that he listened to the “inner voice” and went with “Maharaj ji”. “Antaratma ki awaj mein Maharaj ji ke sath chalegaye,” said Singh. The cross-voting changed the arithmetic of votes for the opposition, especially with independent MLA Raghuraj Pratap Singh, clearing in a tweet that his support for Akhilesh does not mean his support for BSP. “Na main badla hun na meri rajnaitik vichardhara badali hai. Main Akhilesh ji ke sath hun ka yeh artha nahi ki main BSP ke sath hun.” tweeted Singh. Congress, which has seven MLAs in the state, had announced its support to BSP candidate issuing a party whip. Congress assured that their MLAs had not gone against the whip and voted for BSP. While the opposition alleged BJP of “horse-trading”, the party clarified that they have not approached anyone and that the support from various leaders was being offered as they expressed faith in the leadership of Prime Minister Narendra Modi and the CM. “We are going to win all the nine seats. It is not we, who started this. In fact, BSP with just 19 MLAs fielded their candidate, so they started it. Since we had 28 additional votes for the ninth candidate we fielded too and all of them will win,” said Deputy Chief Minister Keshav Prasad Maurya.